Kyiv, September 7, 2015. The ceasefire in the east of Ukraine still holds. The situation near Bakhmutivska road and in the Mariupol sector remained absolutely calm. “There were no cases of heavy weapons use by pro-Russian militants groups observed. The Armed Forces of Ukraine incurred no losses in combat yesterday,” said by Colonel Andriy Lysenko, spokesperson of Administration of the President of Ukraine on ATO-related issues, at a press briefing at Ukraine Crisis Media Center. One militants’ armed provocation took place near Shchastia where they fired from a grenade launcher several times. Ukrainian troops found five corpses of militants’ spies in the vicinity of Bolotene in Stanytsia Luhanska district. The raiders crossed the Siverskyi Donets river and tripped mines two weeks ago. “Chevrons on their uniform showed they belonged to the gang of the late ‘Batman’,” said Col. Lysenko. Militants conducted two attacks in the Donetsk sector using light arms near Svitlodarsk. Militants’ snipers were working north of Horlivka near Zaitseve. 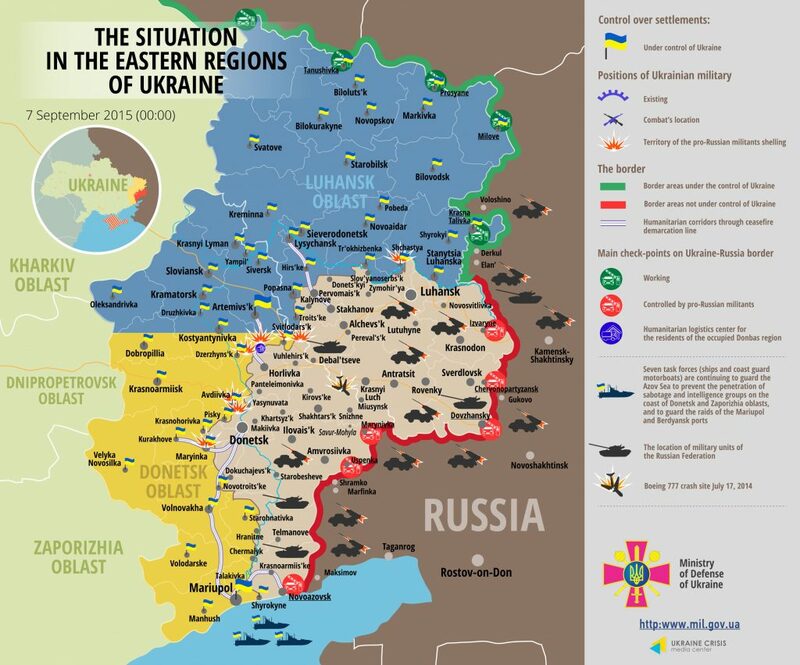 The ceasefire held in the area from Horlivka to Yasynuvata. Another provocation took place between Spartak and Avdiivka, where militants were shooting from light arms, grenade launchers and infantry combat vehicles (ICV). “The tensest situation was in the vicinity of Maryinka where the enemy delivered disturbing fire on leading Ukrainian positions from Petrovskyi area in Donetsk. The militants also used ICVs,” said the spokesperson. Ukrainian troops observed one flight of militants’ unmanned aerial vehicle near Mariupol yesterday. Two Ukrainian servicemen were wounded in the past twenty-four hours as a result of pro-Russian militants’ provocations. Ukraine’s Security Services detained a Russian citizen fighting for militants. The man with nom de guerre ‘Rumyn’ was detained near Slavne in Maryinka district, Donetsk region. ‘Rumyn’ is an ex-convict recruited by the Federal Security Service in Russian penal colony. Later he came to Donbas and was actively fighting against the Ukrainian troops,” said Col. Lysenko. Ukraine’s Security Services continues implementing program of returning citizens who voluntarily withdrew from participation in combat for self-proclaimed “DPR” and “LPR” to the territory controlled by Ukraine. “These days another insurgent who used to participate in Vostok gang came back to his family. The man came to Ukrainian law enforcement authorities voluntarily, admitted his offense and agreed to assist the investigation,” said Col. Lysenko.